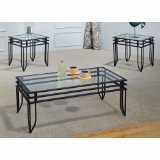 This is a Glass Coffee Table and end table set with glass tops. 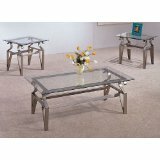 Includes brushed chrome coffee table and 2 end tables. Some assembly is required. This set consists of a coffee table and 2 end tables. Made with an Oak Finish and a carved design with curved legs, with smoked glass table tops. Instructions and hardware included for an easy assembly. Cherry finish on this table set that has a coffee table and 2 side tables. Curved legs with an intricate carved wood design, glass end table tops, and a smoked split-glass coffee table top. Table measures 52 inches by 28 inches by 17 inches high. End tables measure 24 inches by 22 inches by 21 inches high. Assembly is required for attaching the legs. Features curved legs with an intricate carved design in this cherry finish coffee table that also features a glass top. Table is very sturdy and of durable construction, and measures 42 inches in diameter by 19 inches high. Some light assembly is required. 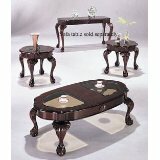 Set includes coffee table and 2 end tables that have a stylish while modern design that features a glass top. Legs are a metal chrome finish with dark brown wood trim, while the coffee table itself has a lower shelf that is made of frosted glass. Coffee table measures 46 inches by 26 inches by 18 inches high, and the end tables measures 23 inches in diameter by 22 inches high. Will require some light assembly that is easy to accomplish. Set includes a coffee table and 2 end tables with the "Matrix" Design. Glass tops with wrought iron style black bases. Some light assembly will be required. Table measures 46 inches by 22 inches by 16 inches high. End tables measure 21 inches by 21 inches by 21 inches.